UKRAINIAN ETHNO DESIGN - Unique design, inspired from handcraft traditions of Ukraine. NATURAL, ECO FRIENDLY AND SAFE TO USE - Does not include any dangerous, lacquer or harmful substances. Heat resistant, does not get hot or exude toxic fumes or melt like plastic. MAINTENANCE - Lasts a long time if taken care of. Protect from direct sunlight. Avoid storing in extremely dry or humid conditions. Do not dishwash, soak or dry in oven. Can be sanded slightly to remove marks of over-usage. NOTICE! - Each piece is unique and may vary slightly in exact shape, size, wood texture and color. May include small knots and cleavages. RISK-FREE - You are fully protected by Amazon terms and conditions and can return the product for 30 days. SPL woodcraft promises to resolve any later complaints for products purchased from our Amazon webstore. Set of three 6.5" different handmade wooden trivets for hot dish, kettle, pan, iron etc. Also can be used as the coasters, table or countertop protection from everything. 100% natural eco-friendly and healthy kitcheware, no silicone, rubber, glue, PVC or toxic finishes. Unlike silicone hot pads, such a trivet doesn't melt or smell even when using with very high temperature. 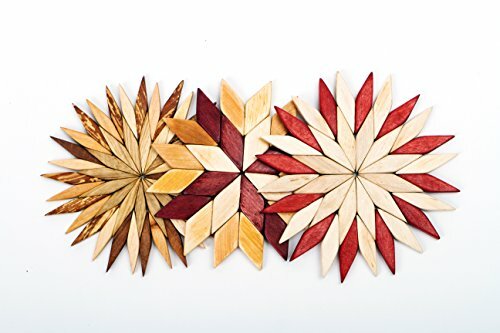 Trivets are equal on both sides. The trivets are very thin, flexible and easy but more stronger than cork or bamboo trivets. Perfect kitchen gift idea for mother, sister, wife or everyone you love! If you have any questions about this product by SPL woodcraft, contact us by completing and submitting the form below. If you are looking for a specif part number, please include it with your message.